Carmen Richter is an independent author who writes as a labor of love. She has a day job in the claims department at an insurance company, so writing is a welcome escape after talking to a lot of people who are having bad days every day. When she’s not writing, she loves going to the movies and attending concerts and live theater (you didn’t think her characters’ love of theater came out of nowhere, did you?). 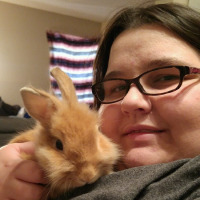 She lives in the Kansas City area with her boyfriend, Brett, a bunny named Marty, and a cat named Mal. I think it's fleshing out the details of stories. So many times, I'll have a vague idea about a story, but I don't really know the details. It's a lot of fun to see a story come together and come to life, but it can also be frustrating when I can't see everything all at once. I do read my reviews. I still get a warm fuzzy feeling when I read a good one. I can deal with bad ones, because I realize I won't please everyone. Besides, my day job is working in customer service. I've heard WAY worse from people I've talked to at work. All. The. Time. When I get writer's block, I'll go back and read previous parts of the story to get myself back into the zone. If that doesn't work, I'll try writing scenes that I know will come later in the book (they can always be tweaked later as needed based on how the story shapes up). Sometimes I'll just set the whole project aside for a bit and work on something else. Or I'll read a book for inspiration. And, honestly, sometimes the very best thing you can possibly do is just to rest for a bit. Watch a movie or play a game of Scrabble with someone or do something that doesn't involve writing.